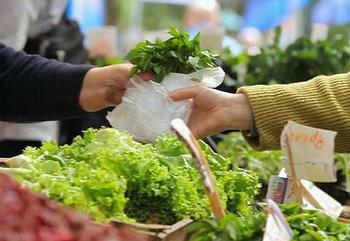 BRUSSELS, Belgium, November 4, 2013 (ENS) – The European Commission today adopted a proposal that requires its 28 Member States to reduce their use of lightweight plastic carrier bags. But how they do so is up to each of them. Under today’s proposal, Member States can choose whatever measures they find most appropriate to meet this requirement, including charges, national reduction targets or a total ban. Lightweight plastic bags are often used only once, but can persist in the environment for hundreds of years, often as harmful microscopic particles that are known to be dangerous to marine life in particular. “Some Member States have already achieved great results in terms of reducing their use of plastic bags. If others followed suit we could reduce today’s overall consumption in the European Union by as much as 80 percent,” said the commissioner. In 2010, an estimated 98.6 billion plastic carrier bags were placed on the EU market and close to 100 billion plastic bags have been placed on the EU market every year since, according to the commission. This number amounts to every EU citizen using 198 plastic carrier bags per year. Consumption figures vary greatly across the EU’s 28 Member States, with annual use per capita of lightweight plastic carrier bags ranging between an estimated four bags in Denmark and Finland and 466 bags in Poland, Portugal and Slovakia. Potocnik said today that “encouraging results” have been achieved by the Irish levy and the Danish tax on plastic bags. Technically, the Commission’s proposal amends the Packaging and Packaging Waste Directive with two main elements. First, Member States are required to adopt measures to reduce the consumption of plastic carrier bags with a thickness below 50 microns, as these are less frequently reused than thicker ones, and often end up as litter. Second, these measures may include the use of economic instruments, such as charges, national reduction targets, and marketing restrictions – subject to the internal market rules of the Treaty on the Functioning of the EU. The high reduction rates achieved in some EU Member States, through the introduction of charges and other measures, show that results can be achieved through effective action. The proposal follows measures taken by individual Member States and from calls by EU Environment Ministers on the Commission to assess the scope for action at EU level. It comes after extensive public consultations that found broad support for an EU-wide initiative in this area. In 2011, the European Commission opened a public consultation, asking the public how best to reduce the use of plastic carrier bags. Opinions were also be sought on increasing the visibility of biodegradable packaging products, and boosting the biodegradability requirements for packaging. But public opinion does not support a Europe-wide ban on the plastic bags. The properties that make plastic bags commercially successful, low weight and resistance to degradation, also contribute to their proliferation in the environment. They escape waste management streams and accumulate, especially in the form of marine litter. Marine littering is increasingly recognized to be a major global challenge posing a threat to marine ecosystems and animals such as fish and birds. There is also evidence indicating large accumulation of litter in European seas. The longevity of plastic bags means that there are now some 250 billion plastic particles with a combined weight of 500 tonnes floating in the Mediterranean Sea alone, according to the European Commission. These particles can cause suffocation in sea creatures that ingest them accidentally or mistake them for food, the commission says, adding that plastics break into tiny particles, and have a high potential for contaminating soil and waterways as they may contain additives such as persistent organic pollutants. At least 267 different species are known to have suffered from entanglement or ingestion of marine litter, says the European Commisision. In the North Sea, the stomachs of 94 percent of all birds contain plastic. Plastic bags have been also found in stomachs of several endangered marine species, such as such as green turtles, loggerhead turtles, leatherback turtles, black footed albatrosses, and harbor porpoises. European waters are littered with plastic bags. They accounted for 73 percent of the plastic waste collected by trawlers along the Tuscany coast. Similarly, plastic bags represented more than 70 percent of total debris in most stations sampled in the Gulf of Lions and around the French cities of Nice and Marseille. 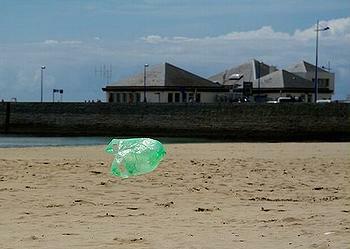 Plastic bags were also found on UK beaches, reaching average densities of one bag every 23 meters.